This paper describes the synthesis and characterization of a fluorescent ion-imprinted polymer (IIP) for selective determination of copper ions in aqueous samples. The IIP has been prepared using a novel functional monomer, 4-[(E)-2-(4′-methyl-2,2′-bipyridin-4-yl)vinyl]phenyl methacrylate (abbreviated as BSOMe) that has been spectroscopically characterized in methanolic solution, in the absence and in the presence of several metal ions, including Cd(II), Cu(II), Hg(II), Ni(II), Pb(II), and Zn(II). The stability constant (2.04 × 108 mol−2 l2) and stoichiometry (L2M) of the BSOMe complex with Cu(II) were extracted thereof. Cu(II)-IIPs were prepared by radical polymerization using stoichiometric amounts of the fluorescent monomer and the template metal ion. The resulting cross-linked network did not show any leaching of the immobilized ligand allowing determination of Cu(II) in aqueous samples by fluorescence quenching measurements. Several parameters affecting optosensor performance have been optimized, including sample pH, ionic strength, or polymer regeneration for online analysis of water samples. The synthesized Cu(II)-IIP exhibits a detection limit of 0.04 μmol l−1 for the determination of Cu(II) in water samples with a reproducibility of 3%, exhibiting an excellent selectivity towards the template ion over other metal ions with the same charge and close ionic radius. The IIP-based optosensor has been repeatedly used and regenerated for more than 50 cycles without a significant decrease in the luminescent properties and binding affinity of the sensing phase. 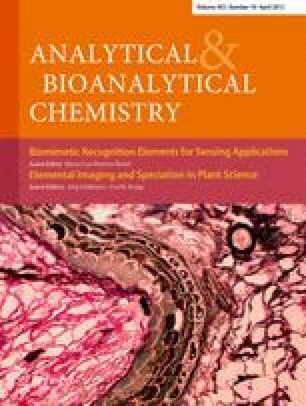 Published in the topical collection Biomimetic Recognition Elements for Sensing Applications with guest editor María Cruz Moreno-Bondi. The online version of this article (doi: 10.1007/s00216-011-5620-0) contains supplementary material, which is available to authorized users. The authors thank financial support from CAPES (CAPES/DGU 125/06), the Spanish Ministry of Education and Ministry of Science and Innovation (PHB2005-0030-PC, CTQ2009-14565-C03), and Complutense University (GR58-08-910072). FAPESP (05/04258-6) and National Institute of Advanced Analytical Science and Technology-INCTAA (CNPq 573894/2008-6 and FAPESP 2008/57808-1) are also gratefully acknowledged.